I am 42 years old, and I wanted to move better and be stronger. 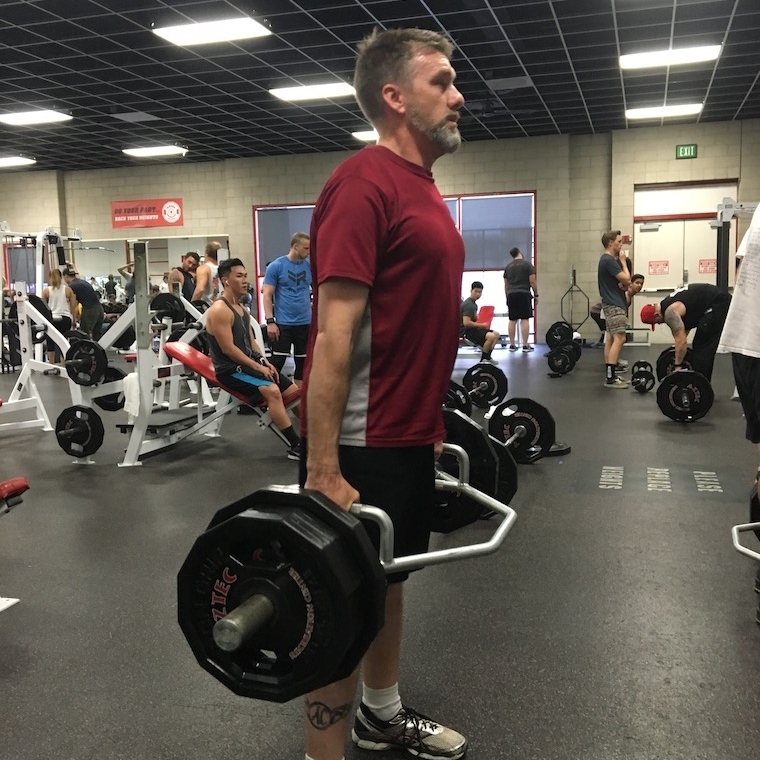 Weight training wasn’t part of my regular routine, but I needed the guidance of a trainer to get me moving after some pretty serious injuries. In June of 2017, at the age of 41, I earned a B.S. in geology from San Diego State. Prior to starting at State, I retired from the Navy, where I had served as a helicopter aircrewman for twenty years. It was a fantastic way to spend a career, but unfortunately, eight months before my retirement, I was in a helicopter crash. Everyone survived, but I broke 14 bones, and spent almost two months in the hospital. I had four or five surgeries, got some metal plates and screws to hold my arm and leg together, and then spent over six months in painful daily physical therapy. The physical therapist got me healed up to the point where I would be allowed to retire, but the physical therapy promptly stopped on my actual retirement date. This left me in a state of "just good enough." I was running and mountain biking, so I was doing okay, but not great. In that same week, I started my undergraduate work, which (for a geology major) included a lot of hiking and climbing, sometimes above 7,000 feet. That's when I decided that I could use a regular workout, preferably with someone watching me to make sure I wasn't going to hurt myself again. I looked through the bios of the trainers at the Aztec Recreation Center, and Brian seemed to be the best suited to deal with my injuries, which at that point, were still only two years old. I told Brian that I was using his workouts for physical therapy, even after he repeatedly told me that he was NOT a physical therapist. It has worked out great! Brian is very careful not to re-injure me, but he still gives me a challenging workout that has made me stronger, more balanced and has done quite a bit to relieve some of the odd aches and pains that I still have from the crash. It is very likely that I will have arthritis in some of my joints...the whole right side of my body, really. Brian has taught me a lot of different ways to stretch to hopefully stave off some of the stiffness and pain that I will have to deal with when I get older. Tony is the master of heart shaped sweat spots. It's not all gym work though. Brian and Anthony always have tips on cooking real, healthier versions of foods that I eat every day. They also do Strong Made Simple extracurricular activities to get their clients together outside of the gym. We paddleboard, we beat each other up on the ultimate frisbee field, we eat tacos. We have a good time!